Business Brokers Network Affiliate Members are the best trained and best educated group of Business Brokers in the United States. They know how to sell businesses! Business Brokers Network evolved from the foundation established by its founders that created a business known as the Dallas Alliance of Business Brokers. The founders were Business Brokers working together in the industry and engaged in the process of listing and selling businesses using the format of that era. As Dallas expanded and economic activity advanced rapidly throughout the Texas area and other points coast to coast, it was apparent that the industry needed an organized and systematic method of attracting, training, and developing additional Business Brokers. The absence of industry information and the fact that business brokering was mostly localized or limited to niche markets and larger cities provided the initiative to establish Business Brokers Network. The absence of such organizations made co-brokering outside the North Texas region very difficult since training and other operating standards were lax, and in many cases, non-existent. Some support was provided by the Texas Association of Business Brokers (TABB) in as much as several of the founders were active members in that organization. Indirectly, business broker organizations in other states were helpful; particularly the California Association of Business Brokers (CABB). The Business Brokers Network concept as we know it today evolved over an extended period of time and from response to the necessity of Business Brokers to service Business Sellers in a more professional manner. As a result of the foregoing activities and over time, the founders developed and refined the concept of identifying, training and assisting individuals interested in becoming professional and successful Business Brokers. Persistence and perseverance were key factors in the early development of Business Brokers Network. Numerous ideas were conceived and attempted but not all were successful. A significant amount of time was required to educate prospective candidates about being a Business Broker and demanded that a structured business brokerage training and consulting program be developed. Business Brokers Network is recognized today as a pioneer in developing and delivering training and consulting services to its Affiliate Members, and in the process, established a new benchmark for the industry. Others within the industry attempt to copy the BBN business model, but cannot duplicate the geographic scope, quality of training, proven processes and results attained by our Affiliate Member Business Brokers. In the 1980's and early 1990's, most Business Brokers and Business Owners did not know about professionally prepared business valuations. During that time period and earlier, business valuations were not understood or available to most Business Owners or Business Brokers. Most business valuations were costly, custom made documents being used primarily for tax, legal or regulatory purposes. The virtual absence of third party business valuations with focus upon Fair Market Value (Selling Price) was a major difficulty encountered by Business Brokers attempting to communicate professionally with Business Owners and Business Buyers. Many observant Business Brokers did recognize the need for an affordable business valuation that Business Owners could trust. A useful and meaningful business valuation was needed at an affordable price. The founders of Business Brokers Network were instrumental in establishing one of the first professional business valuation firms in the industry. This firm provided high quality, affordable business valuations for Business Owners and Business Brokers. The firm is no longer a part of Business Brokers Network, but continues to operate and service Business Owners and Business Brokers, including BBN Affiliate Members, with business valuations focused on current Fair Market Value (Selling Price) for the business. This type of business valuation provides essential information for Business Owners interested in selling their business. The major events occurring during the first fifteen years of Business Brokers Network included the development of professionally prepared business valuations, development of the Internet and corporate downsizing. Near the end of the 1990's few people, if any, could have predicted the dramatic changes regarding the transferring and sharing of business information occurring in the United States and worldwide. The Internet impacted virtually all businesses as its use became more widespread. Additional business information rapidly became available via the Internet to anyone motivated to learn to use a computer. As the availability of the Internet and widespread rapid transfer of business information improved, business brokering became more efficient because important information could be communicated timely and effectively. 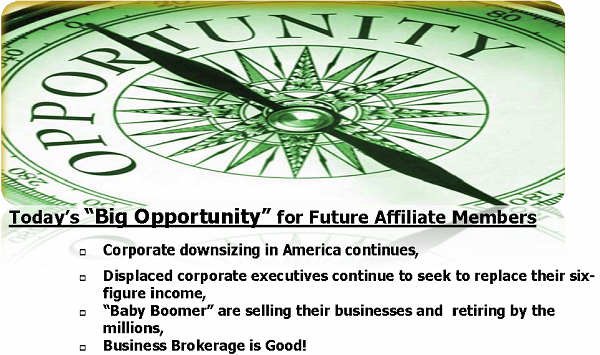 The Internet also led to more effective recruiting of new Affiliate Members at Business Brokers Network during the downsizing of corporate America from the early 1990's through today. As this trend continues, Business Brokers Network is ideally positioned and structured to propel well educated business executives in a new direction to learn a different way to utilize their respective background, as well as their business knowledge and experience, to earn a significant income. Business Brokers Network provides many former corporate executives an excellent opportunity to start their own business and gain financial success as independent Business Owners. Business Brokers Network enjoys the distinction of being One of America’s Largest Network of Business Brokers. We continually identify, train and assist qualified individuals new to the industry to become accomplished and successful Affiliate Member Business Brokers. Recognizing that business brokering does not technically require even a high school diploma in most states, our Affiliate Members are almost all college or university graduates. Many have earned MBA's, PhD's and other post graduate recognition at America's most recognized universities. They have extensive business experience from prior association with successful businesses in a wide variety of industries. We provide state-of-the-art continuing training for our Affiliate Members. Our training and related activities focus upon teaching BBN’s established processes and techniques used to professionally represent Business Sellers and Business Buyers. Our business brokerage training is current, useful and meaningful for serious individuals that desire to be successful professional Business Brokers. Though independently owned and operated, each Affiliate office operates under a standardized system. Our Affiliates can list a business in any state in the United States and that business can be presented in person by another Affiliate to potential Buyers in that state. The Network enables Business Owners to review businesses for sale in any state and to be professionally represented by a trained BBN Affiliate Member. We assist our Members in various aspects of business brokerage, mergers, acquisitions, transaction structuring and related consulting services. BBN’s Affiliate Members provide Business Owners the advantages of co-brokering nationwide…a true national organization. BBN’s Affiliate Members provide Business Owners the advantages of co-brokering nationwide…a true national organization. The Affiliation is structured as a "Members Only", organization. Qualified individuals are invited to become part of One of America’s Largest Network of Business Brokers. Each Affiliate Member of Business Brokers Network is an independent Business Owner operating in cooperation with the Network and other Affiliate Members. Affiliates work together to effectively represent Business Owners to sell their business and to represent Business Buyers interested in purchasing a profitable business. Business Brokers Network is One of America’s Largest Network of Business Brokers. The BBN Process is a Selling Process! BBN provides convenient, efficient and effective webinar training. Affiliate Members receive certificates designation specific achievement for participation. BBN Corporate directors have years of business brokerage experience. They work daily with Affiliate Members to get deals structured properly and closed! During recent years BBN has greatly expanded its library of proprietary processes, tools and documents with innovative approaches to business brokering. BBN periodically presents these innovative proprietary processes, tools, documents, and teaching materials to Affiliate Members by including them in their State-of-the-Art Continuing Education Program. In a similar manner, BBN has established innovative methods for Affiliate Members to broaden their scope of services and expand their efforts for marketing and selling businesses. As a BBN Affiliate Member you are able to work without geographic restriction. You can work with Business Sellers and Business Buyers any place in the United States and parts of Canada. In all areas, you must comply with their local laws. BBN encourages co-brokering within the Network. Many transactions are co-brokered between Affiliate Members, providing the opportunity to get more deals done. An additional income source! BBN Affiliate Members earn large commissions! When Business Owners sell or Business Buyers buy, it is usually one of their largest lifetime financial transactions. BBN and Affiliate Members know how to complete the transfer of business ownership. We've done so a bunch of times before! Today, Business Brokers Network is the recognized national leader in the business brokerage industry. BBN Affiliate Members are located in most major metropolitan markets in the United States and in parts of Canada. Many locations need additional business brokerage representation. All of these locations represent great opportunities for Business Brokers Network and for "NEW" Affiliate Member Business Brokers. We continue to actively identify and recruit "NEW" Affiliate Members. Related business brokering activities generate a significant additional income stream for Affiliate Members. Business Brokering is a commission driven business. BBN Affiliate Members earn most of their income from commissions collected from the sale of businesses. BBN Affiliate Members are located in most major metropolitan markets in the United States and in parts of Canada. Many locations need additional business brokerage representation. All of these locations represent great opportunities for Business Brokers Network and “New” Affiliate Member Business Brokers. Our Success is a direct product of our Affiliate Member's Success! Their Success is a direct product of being Affiliate Members of One of America’s Largest Network of Business Brokers. Visit our Career Center for more information!